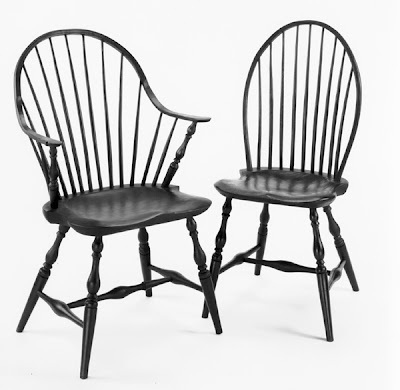 Most of us are fairly familiar with this kind of chair, even if we don’t know that it’s called a Windsor chair (I didn’t), and that the original English design was refined in the American colonies during the 1700’s. 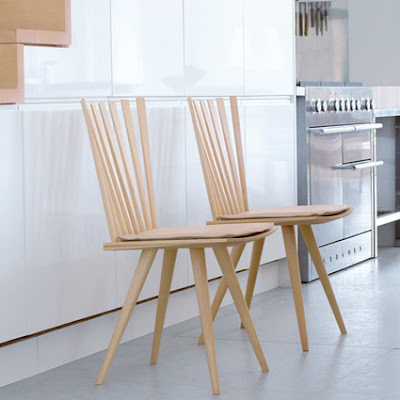 The Mikado chair by Danish designers Foersom & Hiort-Lorenzen is is a modern interpretation of the Windsor chair. The designers say that "the new, dynamic and lightweight version [has] no comb on the back, nor are there any horizontal spindles between the chair legs. This lends the chair a beautiful peacock effect, which looks a bit like Mikado sticks just before they fall to the ground." I think it works as a modern reinterpretation of a classic design, but I just can't help wondering whether I'd keep catching my cardigan on those spindles! 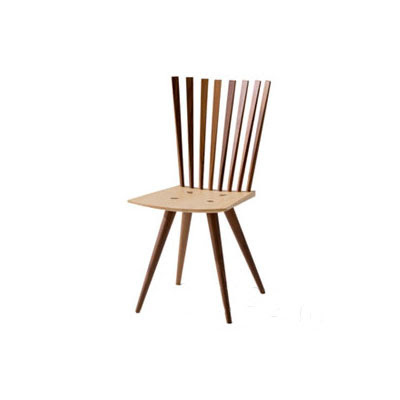 You can get the Mikado chair at DanskDesign, and read more about the history and construction of Windsor chairs here.